The Lexmark X772e MFP is a network-ready color MFP that consolidates a business’s workflow requirements; scan, scan to e-mail, copy, fax and print from one easy-to-use office solution. Mixed Letter / Legal Copy: With paper size sensing of documents in the ADF or flatbed, the output paper size is printed on the corresponding paper size such as letter to letter or legal to legal. The output can also be automatically scaled to fit one paper size such as a letter and legal page mix to all output as letter size. Up to 25 ppm (A4 24 ppm) with a time to first print as fast as <13 seconds in black and <15 seconds in color. An 800 MHZ processor with 768MB RAM standard and up to 120,000 page one-time maximum monthly duty cycle. Display fax queue in process (outgoing and current incoming), Fax preservation in flash memory or on disk, Up to 400 x 400 dpi resolution, Modem speeds from 2400 up to 33600 bps, Group Speed dial, Fax redirect email address, Junk fax block (where available), Caller ID. 400 maximum broadcast locations, Group fax broadcast (delayed send by time and date available) to 46 locations (based on a 10 digit number with a maximum of 512 characters), Speed dial or shortcuts (500 based on a 10 digit number with a shortcut limit of 512 characters), Automatic Redial / Busy Redial (where available), LDAP address lookup for names and fax numbers. Build faxes with the Custom Job feature as well as preview the first page of an outgoing fax with Scan Preview. Scan Preview: Preview the first page of a job to verify settings, document orientation and placement to eliminate user frustration and enhance ease of use. Simple Network Management Protocol (SNMP) v3, Secure Sockets Layer (SSL*), IP Security (IPSec) and 802.1x authentication and user authentication(with single sign-on) provide security measures for multifunction communications and data encryption. Hard disk data wiping and AES encryption for data security and restriction. Confidential printing with enhanced personal ID number (up to 10 digits) management including lockout, job expiration, and invalid PIN protection. *This product includes software developed by the OpenSSL Project for use in the OpenSSL Toolkit. Fax forward to another fax machine, email address, FTP site or a customized Lexmark workflow solution. Build faxes with the Custom Job feature as well as preview the first page of an outgoing fax with Scan Preview. Job Interruption with 'Priority Copies': Interrupt or pause a current print job at the end of a page to allow a user to make a copy without waiting for the entire print job to finish. From customer support with technical support, extended warranty options and Lexmark parts to fleet management and professional services, Lexmark offers flexible and scalable services to make your life easier. 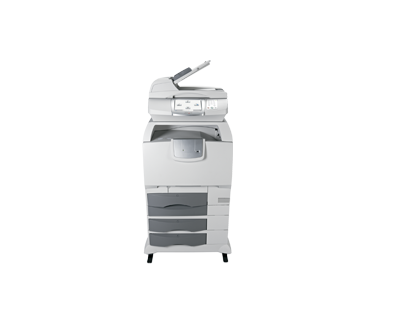 This MFP can be easily tailored to an array of business output application needs for general office faxing, color copying, color scanning and color printing, consolidated on one multifunction printer. Job Cancel: Cancel a print, fax or network job from the job listings using the Lexmark e-Task touch screen icon. Custom Job Copy: Allow a user to set up a group of settings for multiple types of copies. This allows a user to copy more than 50 pages from the ADF, to switch easily between the ADF or flatbed when making quick copies with the same settings, or to collate multiple copies from different original copy sources. Customizable and easy-to-view, large, vivid, well-spaced, familiar icons on the Lexmark e-Task 8-inch (20 cm) color touch screen provide access to print, copy, fax and scan-to-email functions. Graphical 'Show Me' assists in keeping the MFP up and running. Supports direct printing (without a PC) of PDFs and image (TIFF, JPEG, HTML, gif, bmp, png, pcx and dcx) files from a USB flash drive using the convenient USB Direct interface on the operator panel. Or scan a document and save it to the USB Flash drive as a PDF, TIFF or JPEG. Custom Job email: Provides one setting or many settings to be used for multiple types of scans to create one document. This allows a user to scan more than 50 pages from the ADF, to switch easily between the ADF or flatbed with the same settings, to create a PDF that contains both B&W and color (including images), and to use the scan preview when creating a scanned job. Take workflow efficiency to new levels. The X772e is equipped with Lexmark's new Embedded Solutions framework, offering you network-friendly, native support for Lexmark’s wide range of enterprise solutions. 2This product includes software developed by the OpenSSL Project for use in the OpenSSL Toolkit.